Hotelier Impiana Hotels & Resorts will invest some RM200 million over the next three years for new hotels in Malaysia and Thailand. The hotels will be within the Klang Valley, in Tioman, Pahang, and in Phuket, Thailand. Chairman Datuk Seri Farouk Abdullah, in a recent interview with Business Times, said it is now building 12 luxury private villas with individual pools, in Kata Noi, Phuket at a cost of RM40 million. 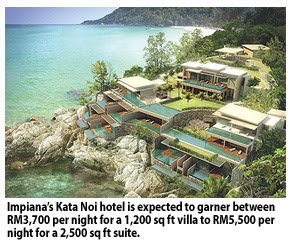 To be ready by end-2009, the Kata Noi hotel is expected to garner between RM3,700 per night for a 1,200 sq ft villa to RM5,500 per night for a 2,500 sq ft suite. In Malaysia, Impiana group is keen to run a four-star or five-star hotel in Petaling Jaya, Selangor or in Bangsar, Kuala Lumpur and it has budgeted RM100 million for this. "We are in talks with a few people, but it is still preliminary," he said. And if it cannot find a suitable property, it will look at building a hotel at one of the two locations it has identified. He expects to fund the purchase of building with internal funds and borrowings. "We are working towards raising the funds," he said. Meanwhile, Farouk said Impiana may also develop up-market villas in Tioman island. "We are looking at Tioman. We have 10 ha of land there. We are looking at 30 to 40 units of luxury villas," Farouk said, adding that this could cost between RM50 million and RM60 million, excluding land. Hotels under the group with the Impiana brand are Impiana Resort Cherating, Impiana KLCC Hotel & Spa, Impiana Koh Samui and Impiana Phuket Cabana Resort. Impiana is also buying the Impiana Casuarina Ipoh, which it has been managing for two years, for RM44 million from Perak Corp Bhd. The hotel, now rated as a three-star, will undergo a RM5 million makeover to be upgraded to a four-star property and help garner a higher room rate of RM230 and occupancy of 75 per cent. Meanwhile, Farouk said that is still in talks to buy between 20 per cent and 25 per cent stake in Impiana KLCC from its owners Heritage Lane Sdn Bhd. MALAYSIAN owned and operated Impiana Hotels & Resorts hopes to have 20 hotels under its ambit by 2015, says its top official. It plans to either own, manage or do a combination of both for these hotels that could be in Malaysia or abroad. The group, with a hotel presence in Malaysia and Thailand, hopes to make inroads into the Middle East market by end-2010. "We hope that in the next two to three years we are able to sign 10 management contracts," chairman Datuk Seri Farouk Abdullah said. "Businessmen from the Middle East have approached us, we should be there (in the Middle East) next year to manage hotels," he told Business Times. There are five hotels under the Impiana brand now, and a sixth - Impiana Kota Noi will open in December 2009. On where else it would like to see the Impiana hotel brand, Farouk said that it would also like to be in Krabi and Bangkok in Thailand. The group's hotel operation now enjoys a gross operating profit (GOP) of 30 per cent with its hotels in Thailand enjoying between 43 per cent and 45 per cent in GOP. GOP is gross revenue (from rooms, food and beverage, laundry or business centre) minus the cost of operations. The five hotels contributed some RM80 million in revenue last year. Given the current economic environment and the Influenza A (H1N1) flu, Impiana projects that its performance in 2009 will be the same as in 2008. In 2010, revenue from hotel operations is expected to improve by a tenth. The Impiana group is part of the KAB Group. Hotel operations and property development each contribute 40 per cent to total group revenue. GLOMAC Bhd says it is willing to sell en-bloc its seven office towers under development to improve its earnings and develop future projects. "If we do have offers (for any of the office towers) that meet our price then we will sell," group managing director Datuk FD Iskandar told Business Times recently. He said Glomac is talking with several parties who are interested in buying the office blocks. "There is now, suddenly, a demand for office towers outside of Kuala Lumpur's central business district," he added. He said Glomac is also close to finalising the sale of a 25-storey building at its Glomac Damansara project. "Hopefully within a month we should be able to make an announcement of a very substantial sale in probably Glomac Damansara first. Its almost a done deal," he said. A recent Business Times report stated that Glomac intends to sell a 30-storey corporate tower in Glomac Damansara to a government agency for RM200 million. The upmarket RM800 million Glomac Damansara development in Petaling Jaya also has another 15-storey office tower, including two 25-storey serviced apartment blocks, five- and eight-storey shop offices, nine- and 11-storey office suites and a hybrid retail mall. Glomac is now marketing the RM75 million 15-storey office tower on an en-bloc basis. Leow Sian Hong ... 'We found Jalan Ipoh to be a strong catchment area'. KUALA LUMPUR: Low Yat Group, which is investing RM7mil to upgrade its Rivercity mixed development at Jalan Ipoh here, expects the project to generate RM55mil in rentals over the next five years. Deputy general manager Leow Sian Hiong said she expected rental rates to double to RM8 per sq ft once the upgrading works were completed. “We expect revenue of RM55mil over the next five years. We want to transform one of Kuala Lumpur’s oldest and bustling areas into a vibrant lifestyle hub,” Leow told a media briefing yesterday. Refurbishment works started early this year and is expected to be completed by year-end. Leow said the group was renting up to 162,000 sq ft of space and was trying to secure tenants, especially for a supermarket it had started building within the development. “We currently have an occupancy rate of 50%. With the supermarket coming in, we should reach 70%,” she said. Low Yat, in a statement issued yesterday, said it was targeting a 90% take-up rate for Rivercity by the first quarter of 2010. “We are very selective about the tenants we choose,” Leow said. In a slide show presentation, Leow said the bulk of the lettable areas would be for food and beverage outlets and offices. Rivercity will also offer home furnishing outlets, beauty and wellness centres, education facilities like the Victoria International College, edutainment, telecommunications and service centres. “Located on nine acres of prime land, Rivercity is positioned to meet the discerning taste and needs of the ever growing population of more than 300,000 families, college, schools, business and commercial entities with its 5km radius,” Leow said. She said the group decided to embark on the upgrades following an in-depth study on the locality. “We found Jalan Ipoh to be a strong catchment area as it is strategically located within the city centre with multiple roads and highways accessible via Jalan Tun Razak, Jalan Kuching, Jalan Duta, North Klang Valley Expressway, Duta-Ulu Kelang highway and the Penchala Link,” Leow said. Property development and investment firm Low Yat Group expects to earn RM55 million in rental income from its Rivercity project over the next five years after it raises prices following a refurbishment. Rivercity, located at Batu 3, Jalan Ipoh, in Kuala Lumpur, features eight 1- to 3-storey warehouses and shop-office blocks, built in the 1940s. The properties are being given a RM7 million facelift, slated for completion by December, its deputy general manager for property development Leow Sian Hiong said. After the refurbishment, Low Yat will increase rental rates to between RM4 and RM8 a sq ft from RM2 to RM4 a sq ft currently. "We are refurbishing the properties to enhance the appeal of Jalan Ipoh and transform the area into a vibrant lifestyle hub. "We may (further) raise rental rates after the fifth year, but it will depend on the market situation," Leow told a media briefing in Kuala Lumpur yesterday. One of the three-storey shop-office blocks has been redeveloped into a seven-storey office building. It is home to Low Yat and Asia Pacific Land (AP Land) Bhd, which has moved out from Empire Tower in Jalan Tun Razak. Low Yat, set up in 1947, is a substantial shareholder of AP Land, which has an integrated development worth nearly RM1 billion next to Rivercity. 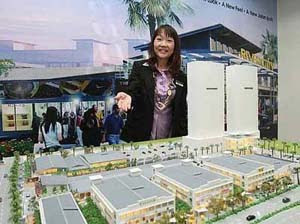 Leow said the remaining seven blocks at Rivercity will comprise food and entertainment outlets, home furnishing concept stores, showrooms, beauty and wellness outlets, and electrical and electronics as well as telecommunications centres. There will also be a 25,000 sq ft supermarket, which will boost Rivercity's current occupancy of 50 per cent to almost 90 per cent by the first quarter of next year. 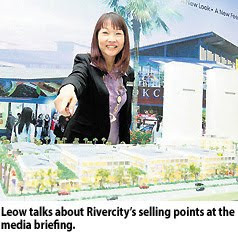 Leow said Rivercity will be positioned to meet the taste and needs of the growing population of more than 300,000 families, students and business community within its 5km radius. Meanwhile, Low Yat's development plans for next year include taking its flagship brand, Fairlane Hospitality, global. Its real estate management firm, Fairlane Hospitality Sdn Bhd, offers hospitality services to the group's serviced residences such as Bintang Fairlane Residences in Bukit Bintang, Kuala Lumpur, and plans to expand overseas. ISKANDAR Malaysia in Johor could surpass the US$13 billion (RM44 billion) foreign direct investment target for its first phase of development due to fresh investment interest from Hong Kong, South Korea and Europe. To date, the economic zone has received 92 per cent, or US$11 billion, of the targeted amount in the first phase of investment. "We have a lot of foreign developers and investors who have expressed surprise that we are not better known. "They said Iskandar Malaysia is Asia's best-kept secrets. We can expect Iskandar Malaysia to have a new wave of investments next year," Iskandar Investment Bhd (IIB) managing director Arlida Ariff told Business Times in an interview. Arlida said investors are attracted to the economic zone as the entry level for investments is lower than other parts of the world. She added that Iskandar Malaysia has become a viable alternative for investors who want to go into less risky types of investments. Three times the size of Singapore, Iskandar Malaysia spans 2,217 sq km and is a mixed use development planned for completion in 2025. The expected investment of US$110 billion (RM375 billion) is split between an initial start-up of US$13 billion from 2006-2010 and US$97 billion (RM331 billion) from 2011-2025. Since its launch in November 2006, the bulk of investments into Iskandar Malaysia have come from Asia, Europe and the Middle East with focus on manufacturing, pro-perty and tourism projects. The biggest investment is from Acerinox SA of Spain and Japan's Nisshin Steel, which have committed RM5 billion in investments to build a stainless steel plant. IIB's Arab partners - Mubadala, Millenium, Kuwait Finance House and Aldar - have committed another US$1.2 billion (RM4.27 billion) to develop properties in Medini in Nusajaya. Interest has also been shown by Merlin Entertainment to build Legoland Malaysia in Medini for US$200 million (RM726 million) and the UK's Newcastle University of Medicine to set up a branch campus worth US$100 million (RM363 million) in EduCity. Arlida said the design for Legoland Malaysia has been finalised and 26 sub-contracts have been awarded. "We target to break ground at the site by November this year," she added. PETALING JAYA: The problems surrounding the implementation of the certificate of approval (COA) on iron and steel products have not been totally resolved, said Master Builders Association Malaysia (MBAM) president Ng Kee Leen. “Some of the industry players are still not aware about it (the COA). However, we have worked closely with the Construction Industry Development Board (CIDB) and some major issues have been sorted out,” he told StarBiz. The ruling on COAs, which are issued by CIDB for the construction sector and by Sirim for the non- construction sector, follows the liberalisation of the iron and steel industry. The move is aimed at preventing the infux of sub-standard products into the country. Rehda president Ng Seing Liong said that while he preferred the market to be open, end users should not be penalised. OSK research analyst Ng Sem Guan said the implementation of the COA would protect the market share of local steel players. It was recently reported that iron and steel products were stranded at several air, sea and road entry points into the country as Customs was unable to clear the shipments without approval from the CIDB and Sirim Bhd.